How many of you have a room in your home that you don't really use? For us, it was our dining room... We put dining furniture there because that's just what you do. For many years, I looked into that room and wondered why we even have it when for us, all we did was eat there once a year on Thanksgiving Day. 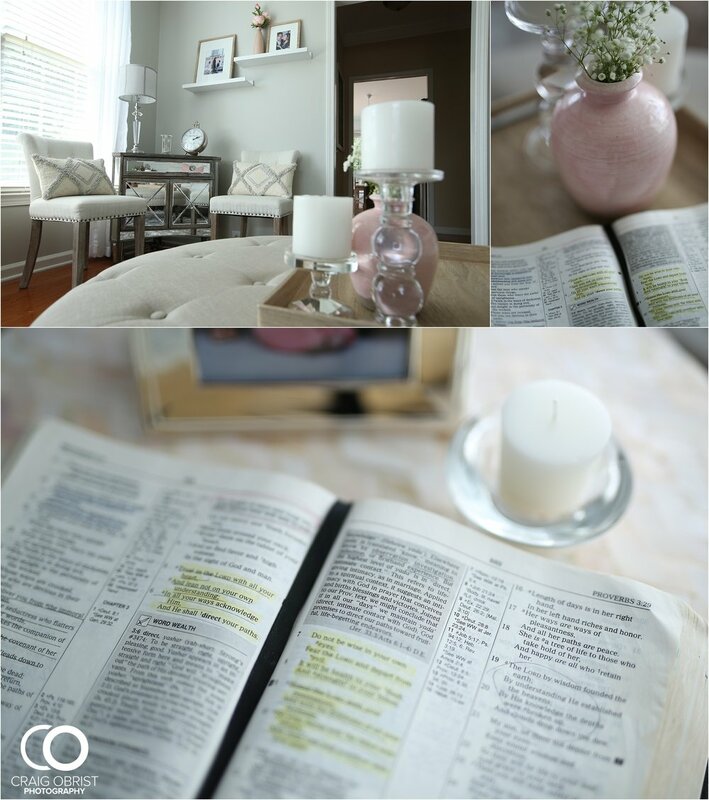 Since last year, God has been stirring in me a need to pray more and to create a space for this purpose in our home. One day, it dawned on me that it's ok to get rid of the dining room and make it into something that is more functional for our family. Part of me thought, "But, is it ok to not have a dining room?" Uh.... yeah! I mean, who cares and is there really a rule for that? No! I'm all about functionality and practicality, and when Craig was totally on board, we decided to make it happen! Well, we finally finished it after months and months and months of prepping the room as well as buying and returning things. :) It kept getting delayed for various reasons. During our peak busy seasons, we couldn't even think about it. But, hey! Better late than ever, and we are so happy to be revealing this room to you as well as share in how we custom design our home and our clients'! 1. Tape a piece of paper on your wall and take a pic! Yes, that's all you have to do! Tape a 8.5"x11" piece of paper and take a photo of your ENTIRE wall and send it to us! The paper is there to give us a reference of measurement. That will allow us to measure the size of your wall and determine what size will look best!! Easy, right? With the photo that you send us, we then design it with your favorite Craig Obrist Photography images and send you various ideas for your wall. In these designs, you will be able to see the sizes of your prints as well as see if the picture(s) you have chosen will look good or not! We will give you our professional input in any questions or ideas that you may have. 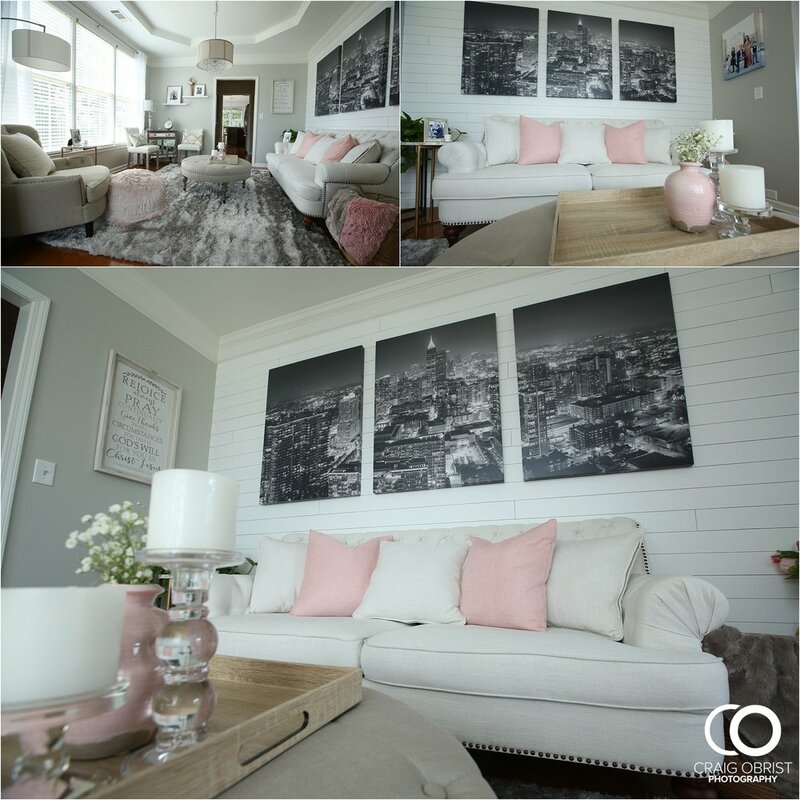 For example, for rooms that are on the rustic side, you want to go with a canvas, not a metallic print. You will see how your wall will look exactly before you place any orders. Our goal is for you to not have any surprises when you receive your prints other than loving it! We care about your financial investment as well as the look of your home as much as we do ours! Below is what our final choice was and wow... we love it. This picture does NOT do the canvases justice at all! If you see it in real life, it just takes your breath away! Here are more detailed images of our entire room! Wanna know where got we some of these things? Paint is my fav color - Repose gray from Sherwin Williams. (It looks gray in any light!) 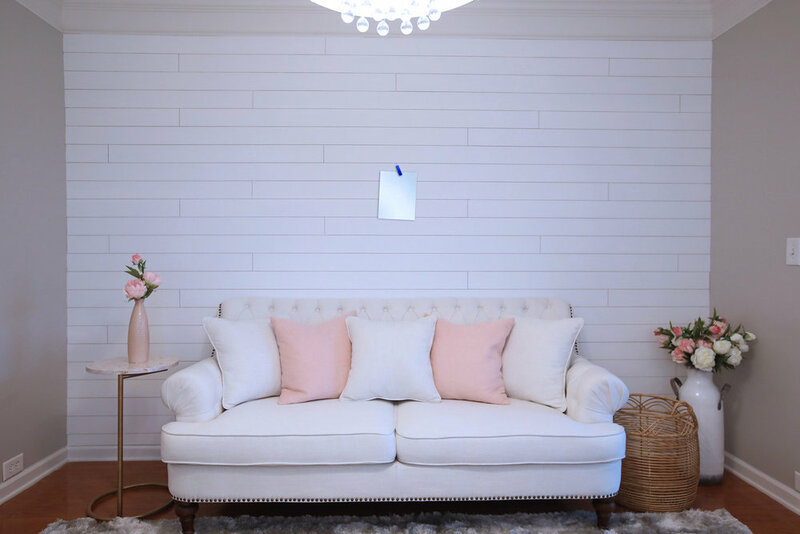 All shiplap material was from Home Depot that Craig customized and made "from scratch". He cut the boards himself and did EVERYTHING! This room had molding in the lower third of the entire room, so he had to rip all of those off and mud and sand the walls before painting. It took a lot of work and many days, and he did an amazing job and you would never know that was even there! The big couch is from Home Goods, the single couch is from Pier 1 Imports, and the coffee table is from "At Home". Knick knacks are from various places like Target, Kirklands, and Hobby Lobby. Oh, I just love every angle of this room!!! Hope this has inspired you to print your photos! Our next room we are renovating is our guest bathroom because oh my gosh, it looks awful in there! Two things are for sure! Yup! You guessed it... it will definitely have shiplap in it and prints! :) I already see it in my head which means more work for my poor hubby. ;) See Craig... this is what you get for being so handy. As always, thx for reading! To keep up with all of our behind the scenes fun, follow us on Instagram AND Facebook stories!